Yes Rental is one of Belgium’s fastest-expanding dry hire companies. Based in Tournai, the company is situated barely 5km from the French border, and just 20km from Lille, and is thus ideally placed right in the heart of Europe. Initially, Yes Rental MD, Frederic Van Durmen, concentrated mainly on developing the lighting department. Now that it has gained a considerable size and reputation and is fully stocked with the latest equipment, he decided that the time was right to move into supplying audio equipment as well. After careful reflection and a number of comparative listening tests, he opted to invest in a significant rental inventory of APG equipment. 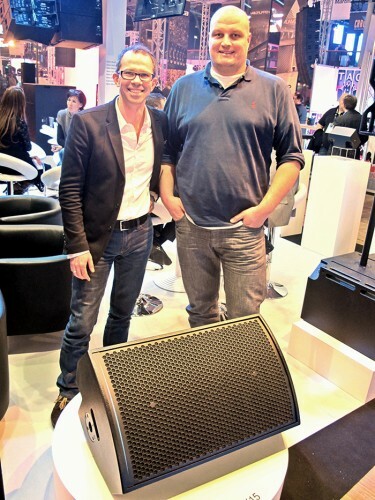 The first tranche comprised 24 SMX15 stage monitors complete with racks equipped with DMS26 digital processors and 24 SA30:2 amplifiers, making Yes Rental one of the first customers for the new APG amplifiers recently unveiled to the international market at PL+S in Frankfurt. The company has also taken delivery of eight TBS118 subwoofers, and coming weeks will see orders for DX5, DX8, DX12 and DX15 multipurpose monitor speakers. Having worked for many years in the European rental market, Fred Van Durmen knows it inside out and is very clear about his intentions. "In order to differentiate myself from the competition, I have to offer something that they don’t have. The answer, for me, turned out to be APG." "The brand is clearly a "challenger" to other, more established brands, but when you put an APG product against something similar from said established brands, it’s no longer just a challenger – it’s an outright winner in terms of performance and sound quality," he says. "In my book, that gives me an advantage over my competitors, because if they want the best, they have to come to me! There is simply no other monitor speaker on the market that can rival an SMX15 in terms of clarity and power, or the DX range in terms of sound quality and versatility." "I fully believe in the potential of this brand, and I like to think that I can be instrumental in their growth, as well as that of Yes Rental," he continues. "My experience in the European rental market and the contact I have with customers in this region will provide APG with invaluable feedback that can only be beneficial to us both." APG’s Xavier Pion concurs. "Fred is a truly valuable partner for us at a number of levels," he says. "He will be a great ambassador for the brand in his territory and his purchase means that APG users throughout northern France and Benelux now have access to a large, well-maintained inventory of all our latest products, with the likelihood of more to come in the short-to-medium term. Fred is also interested in participating with technical development based on his own experience and customer feedback. He believes in our success and wants to be part of it, as we believe in his own success. This definitely qualifies as a win-win situation!"